I started taking photos of the things I wrote on my whiteboard as a student teacher – it would normally be names of students who needed rewarding or punishment on the school’s computer system, and since I wasn’t in my own room I would have to take a record with me to type up in the staffroom. A bit later I started taking the occasional snap of things I’d done in lessons I quite liked, or wanted to use again, or needed a record of the vocab I had given one class so that I could use it again with another. Most of the time, I don’t spend a lot of time writing stuff on the board, because my handwriting isn’t very good, especially if I’m going quickly, and because it’s almost always easier and quicker for me to put my 60WPM typing into practice and make a quick powerpoint slide. Standard advice for new teachers is also not to turn your back on a class for longer than necessary as they might kick off when you’re not looking. Judging by mess in my classroom at the end of most days, there is still a fair bit of chucking stuff around the room going on when I am not looking. Introducing forming the past tense to Y8 in context of sport. 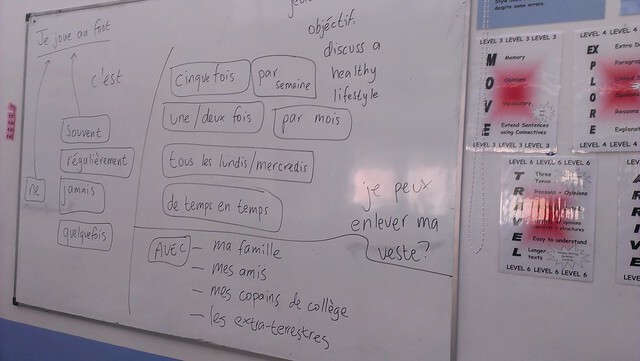 We attempt to drip feed past tense phrases in lexically throughout all they learn, but we focus on getting them to understand better early in Y8. Don’t know why I took this. Dictionary exercise to stage into better L4 sentences with opinions and reasons. J’aime le fruit parce que c’est sucré. I tell them they need CORN for Level 4 – connectives, opinions, reasons, negatives. Je n’aime pas les croissants parce qu’ils sont dégoûants ticks three of those criteria off straight away. NB every time I have done this lesson there have been students who have confused the word they are looking up and come up with transpiration, so now I make sure I disambiguate sweet and sweat before we start. There are still some who don’t listen. 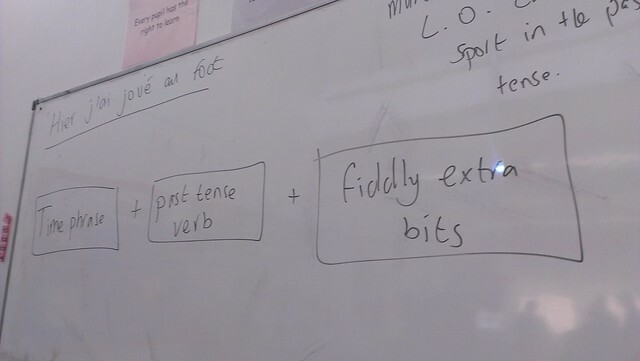 Sport again, but with able Y9 so we add a variety of adverbs of frequency to try and get more sophisticated writing. “Avec les extra-terrestres” – with aliens – is part of a little bit of fun I’m having trying to motivate boys with weird extra bits of vocab. Happily it works with girls too! The criteria say they have to use connectives, nothing about whether it has to be true. Indeed “It doesn’t have to be true, it just has to be French” is a bit of a mantra of mine. Last year in “describe your ideal house” we added “un bassin de requins” into the things we might have there (a shark pond). This year for sports I’m including avec les extra-terrestres and avec mon ami imaginaire. 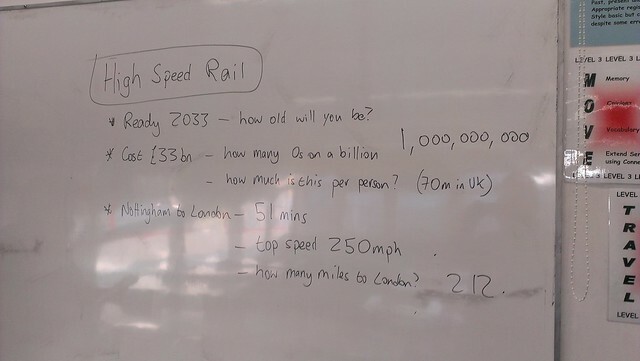 This was turning facts from the morning news bulletin in the car on the commute to school into a numeracy activity for my tutor group. 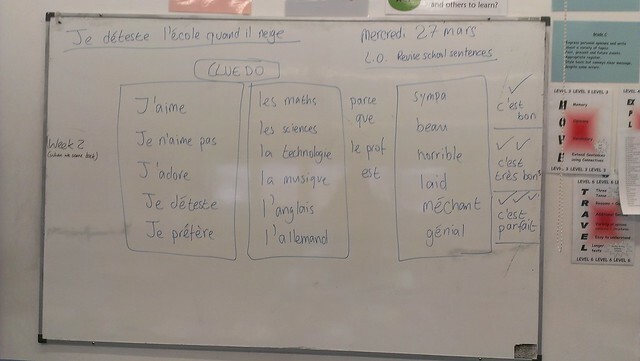 This was the first time I tried Cluedo, a speaking activity I got from Dom’s MFL. It worked really well, so I do it now with all classes that will be quiet enough to let me explain the instructions. It can easily be adapted to use a wholly target language approach. 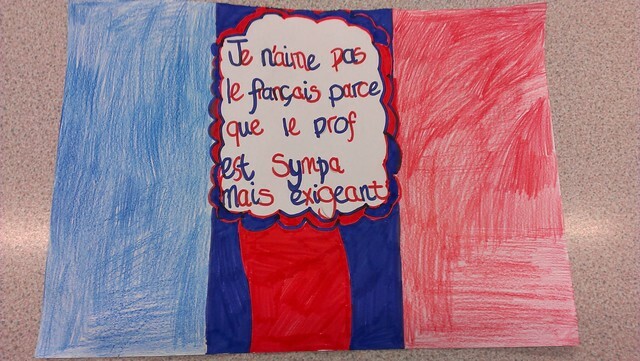 In this case, students love the opportunity to say nasty or nice things about other teachers, although I do stress that we are doing a GRAMMAR exercise about FRENCH and it should not be assumed that they are writing truthful accounts of other real people in school. On teaching practice, the German textbook Echo 3 got students to compare teachers using comparatives and superlatives. After a gale of laughter and some dictionary use I went over to find “Herr S ist der schwitzigste Lehrer” – Mr S is the sweatiest teacher. Can’t fault the German language skill, and if the task is motivating, go with it! One final thing on Cluedo – there was at least one student last year whose writing was improved by a whole level simply because he memorised a past tense sentence generated by an activity like this, and regurgitated it in his writing test. Brilliant. If some can do that, then it’s worth continuing with the activity. A weekend spent – so far – doodling and clearing my head. Immensely tired as we come to the end of the first half term and so I ditched ringing for the third week at the home to stay slobbed out in front of the TV. 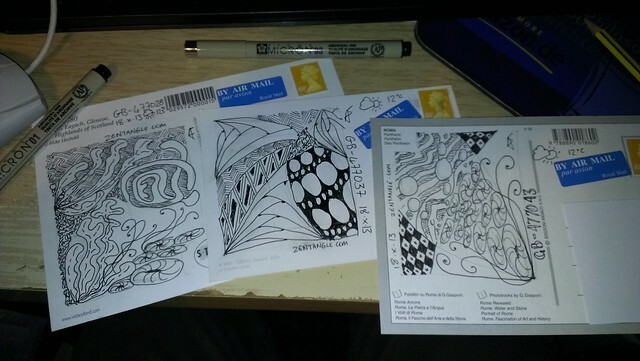 I also came to keeping my hands busy and doing a bit of creative doodling, and so combined two hobbies: sending postcards to strangers through Postcrossing and making Zentangles. Some new types of different tangles. 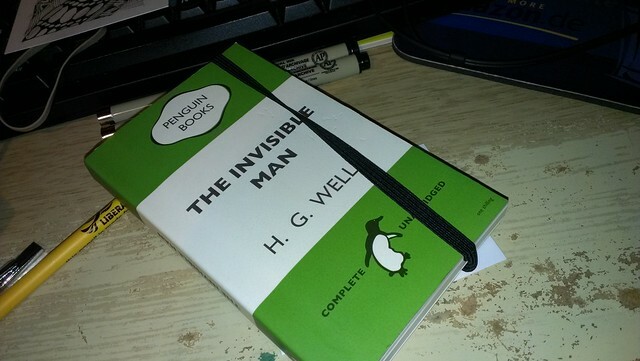 It reminds me of my solo audiobook for Librivox, for which I still get a lot of email thanks from around the world. 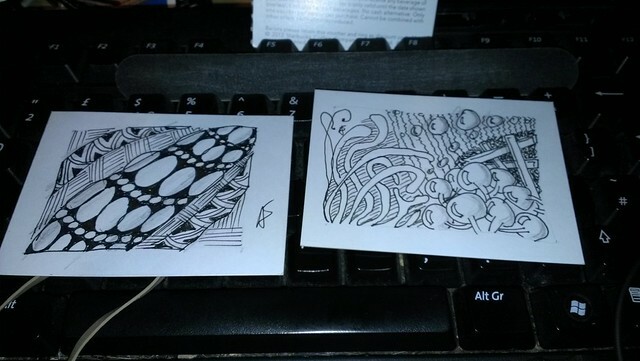 I’ve also been having a go at making Zentangle tiles on Artist Trading Cards. I also thought I’d have a go at making one in colour, using my fab set of multicoloured fineliners. But it looks rather a dog’s dinner. 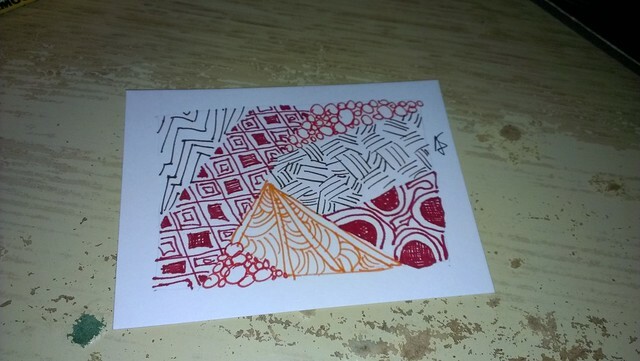 Perhaps I should read teh chapter in my Zentangle book about colour before I have another go. I’m quite impressed with how some of these turned out. I’m no artist but am producing little bits of work that when I return to them months later, I find myself thinking they look quite good. 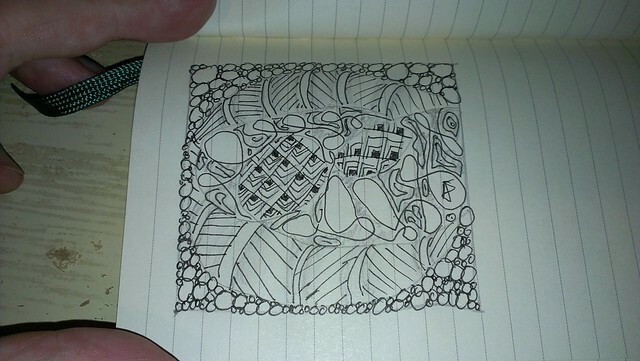 And that’s without the added benefit of the calmness and quiet you get from just sitting doodling for a few minutes. So, last week nearly went to plan, apart from our anniversary night when a choice was made about whether to spend 40 minutes waiting for sausages to roast or waiting for the guy from Dominos to ring the bell. We phoned so late the pizzas were with us in way less than the time it would have taken to cook sausages. I really need to stop ordering such large pizzas as there were slices in the fridge bumping up the calorie count for days. Monday – roasted pepper and caramelised onion wholewheat penne. We’ll have half a jar of roasted peppers left over and some time on Sunday to oven caramelise some onions so this should make an easy veggie start to the week. Tuesday – Beans and cheese baked potatoes. It’s going to be one of those weeks with next to no time to do anything. Gonna have to rely on getting the timer on the oven to do the work and keep it really simple. 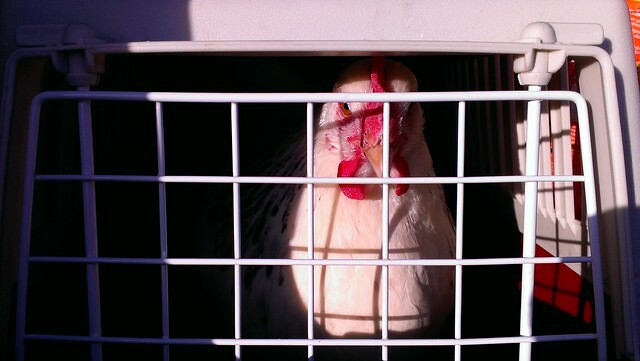 Yup, that kind of a week. Hot meals at school (must remember to take in cash to top up my fingerprint account) picnic food in the evening. I don’t even think there’s a night this week I can have a shopping delivery so I’m going to have to spend some of Sunday battling the crowds in the supermarket. So one of those meals from the freezer you can just bang in the oven. 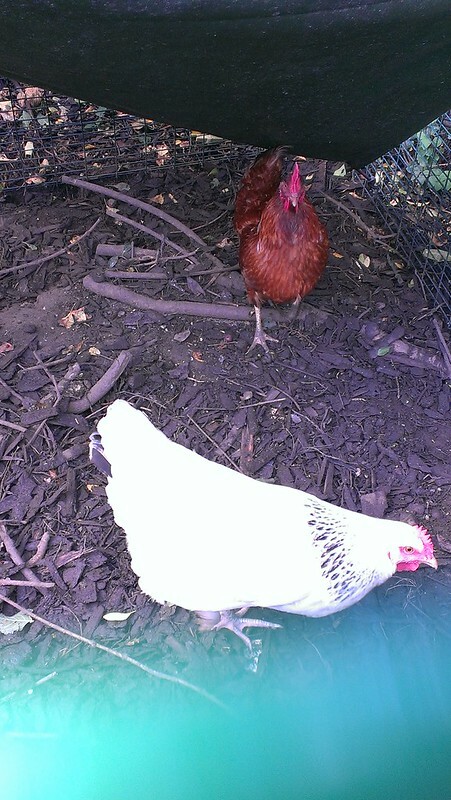 Finally by Friday there may be some time to catch up in the kitchen. I love the small bacon joints, shrink wrapped, long life, and can be forgotten about in the oven while you get on with the rest of the stuff. They last two people two or three days, so it will do a night of bacon joint and freezer veg, perhaps a night of ham egg and chips and there may still be some fab chunks for a third night of spaghetti carbonara to help us gear up for the final gruelling week before half term. Monday – we’ll be having the Mackerel potato salad held over from Friday when I was unexpectedly home alone. I always struggle more to eat healthily by myself. Tuesday – a supermarket stir fry vegetable pack with a ready made sauce. Thursday – leftover sausage pasta – something like the online recipe but I usually do it with red wine, making it heavy on the veg and very light on the pasta – a handful of pasta for the two of us. Friday – roasted mushroom tart – something a little like this one from the blog Manda gave me the link for last week. On Saturday we are going to Clarkies Supperclub – hit the link for the menu. I’m currently thinking salmon, venison, pear, but I could just as well manage duck, pork, apple… We have to be a little careful as there have been too many nights with the Clarkies where we are too piggy, and massively overeat, and end up barely able to move. It all started with Schifffahrt, a fab word with a ridiculous triple F brought to you by the Neuschreibregeln in the late 90s. Earlier spelling rules said that triple letters that are the logical consequence of joining Schiff to Fahrt, should in fact just have the two, because, you know, that would sensible. Then, after I did most of my German learning, the orthographic reform came in, throwing everything I knew into confusion and making the difference between long and short vowels crucial into whether you use ß or not, and adding in triple consonants if they are logically there. For a while I was under the misapprehension that it was Grossstadt, but Duden says it has to be Großstadt. If one triple consonant just isn’t doing it for you, there’s also Flussschifffahrt. And triple consonants are just the half of it. There are also the super long words. The UK press was full of the Rindfleischetikettierungsüberwachungsaufgabenübertragungsgesetz over the summer. But when I showed some of the stories to German friends on choir week, it was a completely new one to them – and they pointed me in the direction of the Eierschalensollbruchstellenverursacher. 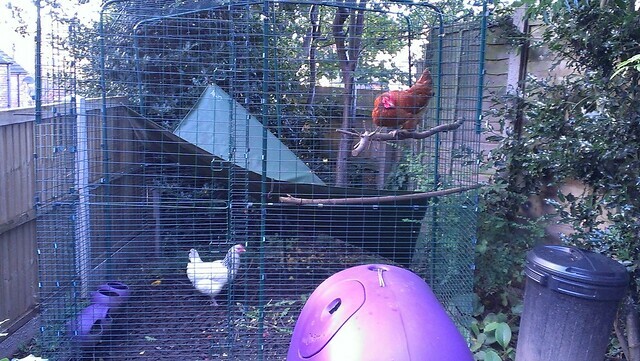 You can see one of those in the video below. What are your awesomest German words? Googling random French words looking for stuff to teach birthdays and celebrations (*), I found a useful booklet with hundreds of grammar drills, gap fills, copy-and-conjugate, match the sentence starts and ends. They were pitched at able GCSE candidates and had lots of useful vocab. I was a little worried to start with that I’d accidentally found something I wasn’t supposed to be able to have without paying, but on closer inspection it turned out to have come from the Northern Irish curriculum agency. I imagine there will be areas where the NI GCSE does not quite match the specs of AQA or other English exam boards but there is still plenty of top notch useful information. There are microsites for French, Italian, Spanish and German, and although I haven’t explored the higher level at all, there are also productive-looking links for GCE A Level materials. The main useful booklet I found was “Resource Pack Expansion Pack” – I haven’t even looked yet in the Resource pack. 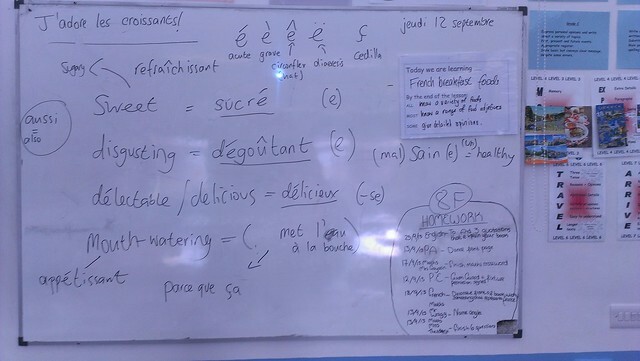 One further source of usefulness, digging back in my memory, was pointed out by Steven Smith of frenchteacher.net. If you have run out of past papers to try (and some schools I know of have a compulsory “we do a past paper every half term in KS4 and 5” policy) it’s worth crossing the Irish Sea to try the archive of French exams over there. (*) I just couldn’t stop myself: after we’d done “fêter” in five tenses, I pointed out you could do all the same for “peter” – to fart. Si j’étais poli, je ne peterais pas. Il faut que je pète.